IDF soldiers attacked by terrorist hurling hand grenades, but manage to capture terrorist after grenades fail to detonate. An Arab terrorist was captured Wednesday morning after he attacked a group of IDF soldiers along the Israel-Gaza border while attempting to infiltrate into Israel. The attack comes following reports of the signing of a ceasefire agreement between Israel and the Hamas terror organization, which controls Gaza. The agreement was reached with Egyptian mediation, and ends two days of rocket attacks from Gaza on Israel. Some 500 rockets and mortar shells were launched from the Hamas-ruled coastal enclave towards Israel since Sunday night, following an incident in the southern Gaza Strip between an elite IDF special forces unit and a cell of Hamas terrorists. 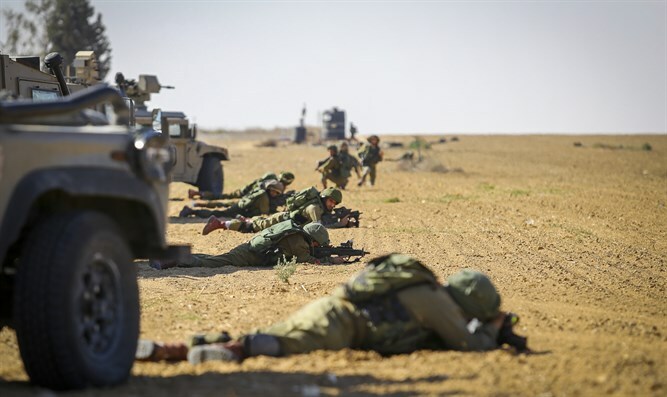 On Wednesday, the Israeli military reported that a terrorist operating inside Gaza had approached the border in an attempt to infiltrate into Israel. The terrorist, who was later found to be carrying wire cutters, attacked IDF troops stationed on the border with hand grenades. The grenades failed to detonate, however, and Israeli security forces opened fire on the terrorist, and were later able to capture him. In addition to the wire cutters and grenades, the terrorist was found to be carrying a knife. Following his capture, the terrorist was transferred for interrogation, an IDF spokesperson said.